Think back to your school days and you’ll probably have a teacher that stands out in your memory. Whether they played a pivotal role in shaping your education and future, or thanks to their always seeming to have it in for you, there’s no doubting the influence that teachers can have on your future. For the pupils of Kunugigaoka Junior High School however the question isn’t so much how their teacher may influence their future, but whether he’ll allow them to have a future at all. Koro-sensei (as he’s known) isn’t primarily a teacher at all, but rather an octopus-like creature who has already blown a massive hole in the Moon before asserting that the Earth will be next unless mankind finds a way to exterminate him in the next year. For reasons still not entirely clear, Koro-sensei has chosen to spend this year working as a teacher at the aforementioned Japanese school, wherein he’s demanded to be allowed to teach one very specific class – Class 3-E, the home of the lowest-scoring and supposedly least able pupils and a group of which the school is so ashamed they’re hidden away in a ramshackle hut on the outskirts. As it happens this arrangement suits the Japanese government, keeping the near-indestructible monster out of the public spotlight where he’s likely to instil panic while also leaving him open to attack and assassination. 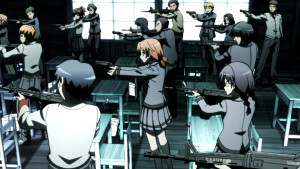 With some of the world’s top professional assassins having no luck taking out Koro-sensei, and given that his role as a teacher insists upon him not harming his students, there’s only one thing for it – to train Class 3-E as assassins and have them take down their own tutor before the Earth is destroyed. Koro-sensei himself is oddly enthusiastic about his charges’ new training, and is happy to help them learn the tricks of the trade that might just lead to his own death. Clearly, there is more to this yellow fellow than meets the eye, and beyond that colourful exterior resides a heart of gold. 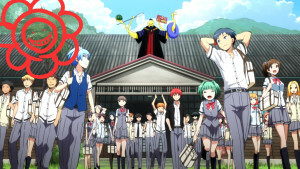 It’s this aspect of Assassination Classroom that seems so incongruous on paper but works so well in practice – Koro-sensei is the mortal enemy of the kids of Class 3-E, yet as the series progresses they find themselves not only warming to him but discovering a growing determination to protect him from a number of underhanded assassination attempts. 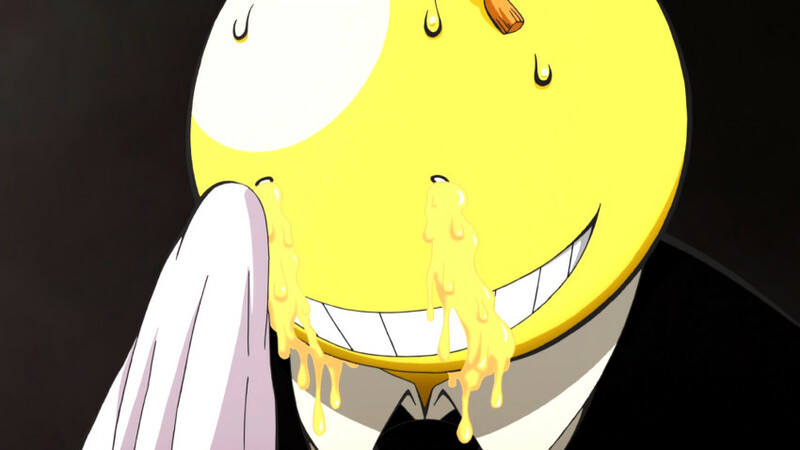 As we follow events throughout, we come to learn more not only about Koro-sensei’s personality and proclivities, but also more about the class themselves, offering plenty of opportunity for drama and character development. There’s a very clear thread of socio-political commentary that runs through Assassination Classroom – it spares no scorn for the idea of writing off swathes of children as “stupid” or “useless”, regularly reminders the viewer that you can’t judge a book by its cover, and it goes to great pains to show what can be achieved by carefully nurturing a group of kids and playing to their strengths. It’s hard not to be won over by its argument – even the most seemingly unhinged of troublemakers in Class 3-E are deftly humanised as we learn more about them, while our very own education system in the UK and its obsession with improving results and league tables over preparing pupils for the future doesn’t feel like it’s a million miles removed from the ruthless goals of Kunugigaoka. That is ultimately where the true marvel of this show lies – its ability to take a world-ending monster and make him the hero whilst turning his biggest opponents into a variety of villains. It’s enough to leave you conflicted, just as Koro-sensei’s students certainly are – you’re desperate for them to succeed in an assassination attempt, yet that would also end the wonderful rapport between the teacher and his pupils. 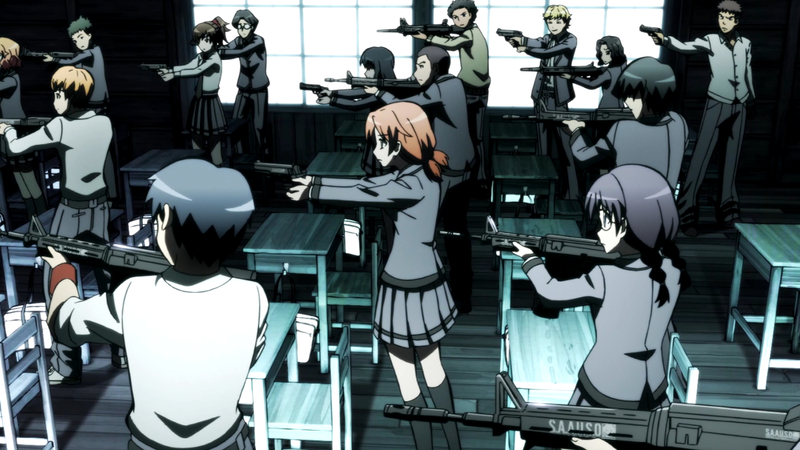 Oh yes, we should probably mention the assassinations, given their prominence – away from the enjoyable character-driven antics of the series, there’s also a lot of fun to be had from watching Class 3-E’s ever-more elaborate schemes to do in Koro-sensei. Every episode sees them learning a new, albeit minor, chink in his proverbial armour, and they come ever closer to achieving their goal. It isn’t just their direct target who finds himself on the receiving end of the group’s potential, as other players in the race to kill Koro-sensei come to serve as objects of the class’ ire when they overstep their bounds. Although it would be wrong to call Assassination Classroom “action-packed” in the traditional sense, the series still manages to ramp up the tension as required when things threaten to get deadly, but without ever losing the refreshingly simple humour that runs throughout the show. 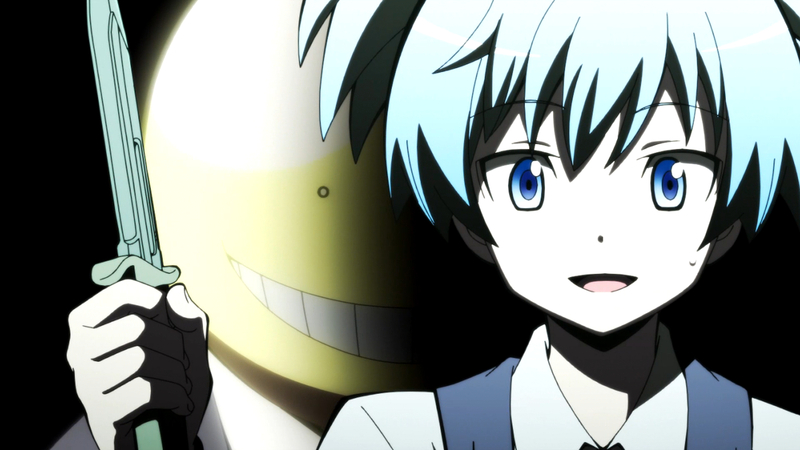 One suspects that if a teacher were to write out a report card for the first season of Assassination Classroom, she would praise it as a well-balanced, caring and hard-working student that shows potential to go onto even greater things in the near future. Given its easy-going, fun nature with a serious streak when necessary, it would probably be the most popular kid of the class, too. Assassination Classroom, season one, is released in the UK by Anime Limited. Great write-up. I would be watching the dub already had you not delayed the DVD release randomly. Oh well, will make me think twice about pre ordering DVDs from you as I dislike random delays immensely. Psychic School Wars... 80s Style!